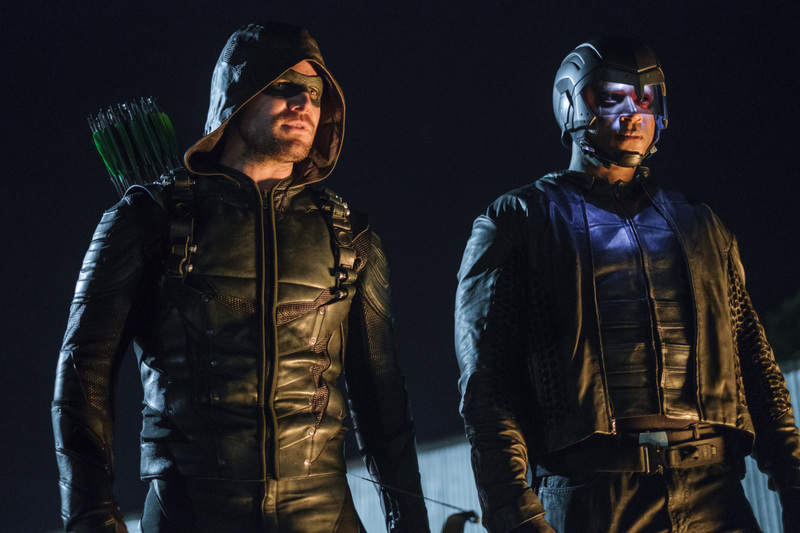 Something big certainly happened on Arrow, didn’t it? It’s something that probably never would have happened four or five years ago, symbolically showing how far the show has come and signaling a new change for the series as a whole. That’s right, I am talking about…the new title card. Instead of Oliver’s typical arrowhead, we get icons for the whole crew—Canary, Wild Dog, Terrific, Overwatch, and Spartan, followed by Green Arrow’s. Though they’re all together as a unit, the show is more willing to pair various characters off together than it was in the past, with decent stretches of time between them meeting with Oliver to discuss their next plan of attack. In short, “Tribute” works because it lets the characters drive the story of Oliver’s identity being exposed rather than the other way around. Obviously, Oliver’s secret at risk is an “all hands on deck” situation for Team Arrow. It always is, but making this more urgent is the fact that there are three members on his team who’ll instantly get caught in the crossfire once all those secrets come out. Dinah, Lance, and Rene are just as screwed because of their jobs as cops and members of the Queen administration, and while the show doesn’t say this explicitly, it doesn’t need to. And while they’re doing their best to handle it, Felicity and Curtis have a conversation that’s just as accurate as it is amusing: what do the non-Oliver members of the team do if they get caught and escape jail? This secret identity crisis truly affects them all, and it’s a situation that very quickly spirals out of hand thanks to both criminals and the law. Also not helping matters is the return of Anatoly, but it’s anything but welcome. After being cast out from the Bratva for showing favoritism to Oliver, he’s looking to get back in, and holding businessmen for ransom is his only solution. Last season’s present day scenes cracked away at the loving relationship that the flashbacks perfectly established between them, and this episode straight up obliterates it. It’s hard to imagine them repairing things after Anatoly went full evil and a shot his hostage after Oliver cures him of a virus. Anatoly lists off the things that he very well could do to William because he’s still a good man deep down—it’s hard to argue that, even if he ultimately wasn’t the one who leaked that picture of Oliver’s secret. Look, at this point, anyone who hasn’t pieced together that Oliver is Green Arrow is either pretending or just really dumb. It’s happened too many times in Star City for the smartest citizens to not at least consider the possibility, so the inclusion of the FBI is a much needed way to ramp up the stakes. Agent Watson may be several FBI tropes thrown into a blender—no nonsense, mocks the city cops for their incompetence, connecting dots where present—but Sydelle Noel is giving her the right grit to make it clear that she means business and won’t back down on this as easily as cops and reporters have. Her smirk when she hears that the allegations are false shows that she can smell BS from a mile away, and she’ll bring the truth out. Oliver may have avoided his secret being exposed this time, but it turns out to be a smokescreen for an even bigger reveal the show was hiding. Namely, that Oliver’s retiring in order to be with William, and passing his mantle down to Diggle. Just like the identity exposure, the show has played around with Oliver retiring in the past. That this decision comes from wanting to spare his son the fate that befell him years ago is, in all honesty, a reasonable and mature decision to back away from the hero game. It’s unclear how long this will stick, but it feels like the show reasonably could keep this change for as long as it likes. Or, maybe not, given that Diggle isn’t exactly at 100%. Rather than having some kind of trauma from the island explosion, his problem is relatively simple: shrapnel got caught in his shoulder during the island explosion and he’s got degenerative nerve damage. He can’t even fire a gun, let alone shoot a bow and arrow, as Dinah is all too aware of. She’s right to be pissed at him for keeping this secret for five months, and given that he chickened out of telling Oliver, it’s a secret that could get the others killed. That’s the real gamble that we’ll have to see if Arrow can pull off. • Why doesn’t Diggle have to worry about money? “He’s married to the head of ARGUS,” Curtis says in the most perfect explanation. • More Rene and Oliver bonding as dads. That’s a dynamic that needs some fleshing out. • Felicity and Curtis are going into business together. Here’s hoping both of them have seen Social Network. • Whatever kind of father Oliver ends up being, it’s definitely going to be one who doesn’t discourage his kid from fighting. Can’t tell if that’s good or not.